When your dog puts his front half on the ground with his rear in the air, or when he looks at you wagging and barking, he wants to play! A walk or a treat just won't do! I found playtime very difficult at first, as we could only take Cray in the garden on a lead because the fence wasn't high enough. Obviously, dog-proofing the garden was a priority. There is not really enough space for rough and tumble in the house. Coupled with this, he didn't seem to know how to play; only that he wanted to! After trying an assortment of toys including kongs (rubber domes in which you can place treats or food), chewy bones, tugger toys and so on - all of which were met with ambivalence and probably confusion - I eventually found a toy he loves; furry things which squeak. I was sent some from a "pound shop" which were badly made and he soon pulled the stuffing out; only get good quality toys from a proper pet shop. Even then, they can easily be torn to bits, so supervise closely until you know how they will hold up. Cray has a squeaky red and green furry football, a squeaky pink furry rugby ball, and even a squeaky furry hotdog. He loves to pounce on them with his mouth and his paws, and then to take them to his bed where he will lie and chew them for ages - a very noisy process! Another advantage of these soft toys is that a muzzled dog can still pick them up through the gaps in the muzzle, and can still play by pouncing on them with their paws. 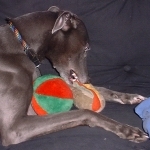 Once the toys have lost their squeak, they are much less interesting, as well as when he has had them for a few weeks. You can revive a damaged squeaky by washing in hot water, then popping it into the washing machine. If it's a heavier toy such as a rope tugger, put it in a pillowcase with some softer items to wash. Don't dry them - they should come out fairly dry and can be pinned on the line. Mine went from mud coloured to almost as good as new - and the squeak returned too! As an alternative, old socks made into a ball are quite satisfying too, but don't last as long! Sometimes a "squeaky" won't do. At this time you can play games with food. Try "hunt the treats" - take a handful of treats into a room and close the door behind you. Hide the treats about the room. To begin with, keep it simple - in front of a chair or just in the middle of the floor. Then bring the dog in. At first Cray thought I had all the treats in my hand still - then he thought there was just one (and I had to show him where it was even then). After a couple of tries where I led him to the treats, and then just to the rough area, Cray has now learnt to use his nose rather than his eyes to track down treats (and to work out if there are any more or if he has found them all). I am starting to be able to use more cunning hiding places (but never on furniture where he is not allowed such as the table). It is a game he looks forward to and we play it mid-morning every day. After a couple of runs of "hunt the treats" he is ready to curl up at my feet again. My friend has a variation on this theme; she puts a treat under one of three mugs. She swaps the mugs around, and the dog has to put his paw on the mug with the treat under it in order to win the treat. She says it was easy to train the dog by placing his paw on the mug (and of course he can smell where the treat is, which us silly humans can't do). If you're finding it difficult, first train the dog to give you a paw on command (mine learnt in about 20 minutes, with a few demonstrations and some tasty treats on hand) and then get your dog to "paw" on the treat. It makes an excellent party trick!